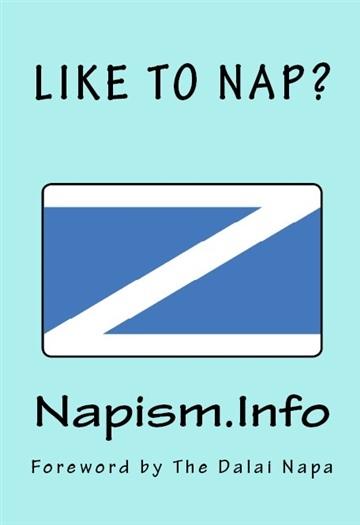 Napism.Info - for people who take their naps "religiously"
Napism: for those who take their naps "religiously", those who get teased about taking naps, AND those who like to tease others about taking naps . . . The wisdom of Napfucious and N'apseop's Fables . . . a Napa Sutra (list of napping styles) . . . NapFu . . . clues to identifying a Napist in your family . . . and more! Note: this is both a book and a website, each with material suited to the medium. For example, the website has FREE downloadable screensavers, a video of an acoustical guitar version of The Napistic Blues, and more. Sleep: the final frontier. These are the thoughts of the Nap Masters, their continuing mission: to explore strange new dreamworlds; to seek out new nap places, positions, and styles; to boldly nap when and where no one has napped before . . .
nutty and it makes you grin. fun with this book weeks after we read it, so we recommend it highly. running next door, but this comes very close. sit down and read front to back, or just flip through it and laugh as you go.